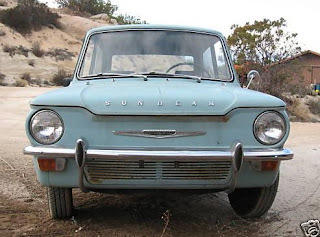 1963 Sunbeam Imp - This was supposed to be Rootes Motors Mini fighter. It proved to be Rootes undoing. Introduced in 1963, it was a rear engined car. It was a type of car Rootes had no experience in building. The engine was new - a Coventry Climax derived aluminum 875cc unit. The suspension was semi-trailing arm independent at the rear, swing axles in the front. The car was rushed into production and early ones gained a reputation for being unreliable. That, combined with the costs involved in developing a completely new car, a new engine and a new factory proved to be too much for Rootes. In 1967 they were taken over completely by Chrysler. These cars do very well in vintage racing. The sophisticated (for the time) rear suspension gives them better handling characteristics than most rear engined cars of the day. This car appears to be in good, restorable condition. It's complete and has very little rust. (One thing I noticed, and hopefully it's just the angle of the picture, is the front wheels don't look right in the picture above.) Turning it into a vintage racer would be cool, but bringing it back as a usable road car would be cooler. 1968 SIATA Spring - "SIATA made many great cars, but the Spring won't be remembered as one of them". That line comes from a SIATA Spring enthusiast website. That's never a good sign. Who knows what SIATA was thinking with this car. Contrary to common belief, it was not designed to resemble the MG TD. It was designed to resemble the SIATA Rallye, a car SIATA built in the 1950s to compete with the MG TD. No matter, while the Rallye was an impressive front-engined car, the Spring was a rear engined car based on the Fiat 850. It looked odd and it drove odd. This car needs total restoration. It's missing a few parts and has some rust, but it's not a parts car by any means. SIATA was once an impressive auto manufacturer. It's sad that the Spring was its last car and, at least in the US, it's most well known car. Still, it's a piece of automotive history, one that's pretty hard to find these days. 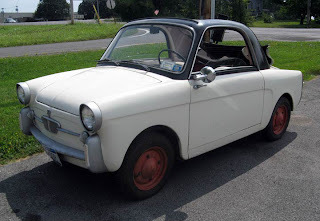 1960 Autobianchi Bianchina (Fiat 500) - This is another one of those cars that you don't realize just how small it is until you stand next to it. 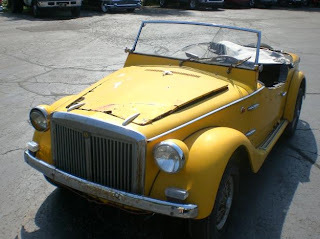 This is a Autobianchi Bianchina Trasformabile, a semi-convertible. The engine is a 479cc 2 cylinder that puts out a whopping 15 HP. Even with this tiny engine, the car, due to its light weight, is capable of 60 MPH. Autobianchis were all based on Fiat products. Fiat was part owner of the company, along with Bianchi and Pirelli. This particular car is based on the Fiat 500. This car is being sold by Walter Miller, a well known dealer of automobile literature and car freak. It's safe to say the description of the car is accurate.